I’ve been shirking my recap duties, I know. Here are a few quick hits from last week’s run. Ill-prepared: Not enough Gu, no maps… what do you wantfrom a guy coming back from vacation. Humidity-palooza: A hurricane goes by threatening rain and wind and tropical humidity. The sun’s shining and there’s a gentle breeze but somehow we still get the tropical humidity. Two English Guys meet. For the first time English Dave who we’ve known for years and UK Wayne who we’ve known for months finally crossed paths and met. And for those of us that feel stupid because we can’t tell if someone is from the UK or Australia, Dave did ask Wayne “AreÂ you from the UK?” when he heard him speaking. It’s all in the sales pitch. Brian Slater’s New Englander complaining about the hill from Grimsby’s to Spot Pond was in stark contrast to Wayne’s “isn’t this a lovely a hill” which almost made is sound like we should be enjoying it. Why am I running with all these fast people? When I got to Spot Pond I noticed I was running with the wrong crowd. Joe, BrianS, BrianG, Mary, Wayne, Dave… this isn’t a good way for me to start a 14 mile run. Water stop 1: Ice cold Gatorade thanks to the Cossette’s cooler in Carol’s car. I lingered long enough to lose the front pack and settle in to the second group out. Turkeys! The front group reported a live wildlife sighting, a rafter of turkeys along Franklin St. Yes, a group of turkeys is called a rafter. Chinese Turtle? Also sighted along the way wasÂ a turtle… although upon closer inspection it was a discarded chinese food container. How can I possibly be running with Judi? Heading across Cross St, to one side I had one of my usual running companions, Mike. On the other side though was Judi. These people are giving me a false sense of speediness. Hollywood’s got nothing on our long run routes. The conversation Judi and I made on our way to Horn Pond included a discussion of movie filming on our long run routes. This week we started out passing the Melrose Bank Building on the corner of Main and West Foster St where the Ben Affleck will be filming a bank robbery scene for an upcoming movie. Next week’s run through Breakheart will take us by the shooting location for Fury Vengenace starring Brendan Fraser and Brooke Shields. Water Stop 2. More Gatorade, more water to replace the fluids that have soaked every bit of my running clothes. Glistening Muscle Man and the Traffic Director Guy, like clockwork these two regulars will be found circling the pond. The sweat glazed muscle man, shirtless and fully flexed was spotted twice as we circled the pond, both times lugging those powerful arms of his motionless by his side. In sharp contrast the traffic director guy was spotted frantically waving his arms to alert all of us runners that we could run by… which we would have done anyway. Cross Street is the longest street evah! This straight, somewhat flat, unshaded mile long road seemed to go on for ever. Especially for Rachelle who wasn’t feeling well and had the pleasure of watching the endless stream of unhappy runners trudge by her. The Forest Street Hill… at least its shady. The climb isn’t fun but the chance to get out of the sun and feel a cooling breeze through the trees made it worth it. Plus you have to admit, each time it gets just a little easier, doesn’t it? Water Stop 3: With moisture dripping off of us, one last chance to replenish before the last 4 mile stint of the run. Marble to Summer to Franklin… unless you’re following Nick. Pretty much straight from the water stop to Franklin St. If you were running with Nick though he took you down Park St and up Main St to add a little more on to the mileage on what was shaping up to be a tough enough run as it is. A reminder, review the route, bring a map, don’t follow Nick. Why did the runner cross Franklin St? Because it was shadier over there. Actually now it shadier over the other side. If we weren’t sweating enough in cool humid temperatures, the stretch along Franklin St was sunny and hot. Along the two miles of roadway it seemed like the shady side of the street switched sides every 50 yards which kept the question alive in my head, is it worth running all the way across the street to get out of the sun. Laziness beat out over coolness as I opted to hug the right side of the road the whole way. Others reported opting for coolness though. In the end, looking tired and worn, it looked like we all made the wrong decision. Main St has no shade… I’m melting! The home stretch from Franklin St to Brueggers along Main St took the shade option off the table. Nothing but sunshine through the last mile, which I have to say seems so much longer at the end of a long run. Done, soaked in sweat but done. Most looked like they had just been swimming in their running clothes when the walked into Brueggers after the run. Quite a challenge for an “easy week”. I’m back from vacation… just in time for an interesting long run. As Hurricane Bill passes to the east of New England he’ll throw some intermittent rain our way, some wind too, but of most concern to us is the humidity. It’ll be in the 70s for most of our run to Horn Pond and back, but as we’ve learned recently “it’s not the heat, its the humidity”. The 90% humidity will be hitting our area just around the time of our run so start hydrating NOW so you have plenty of sweat stored up for the run!!! The long route is out to Horn Pond and back, the short run is out to the water stop and back (same as last week but in reverse). If you’re running short and don’t want to look at the same scenery as last week I suggest meeting us at the water stop and running the 7 miles in the middle instead. Running tip of the week… I’m gonna take this one from Ginny, bring along a bandana to tuck in your waistband, it’ll come in handy for wiping away the sweat as you go along… and I guarantee you will sweat tomorrow! Water stops. Rachelle volunteered to do water stop 1. 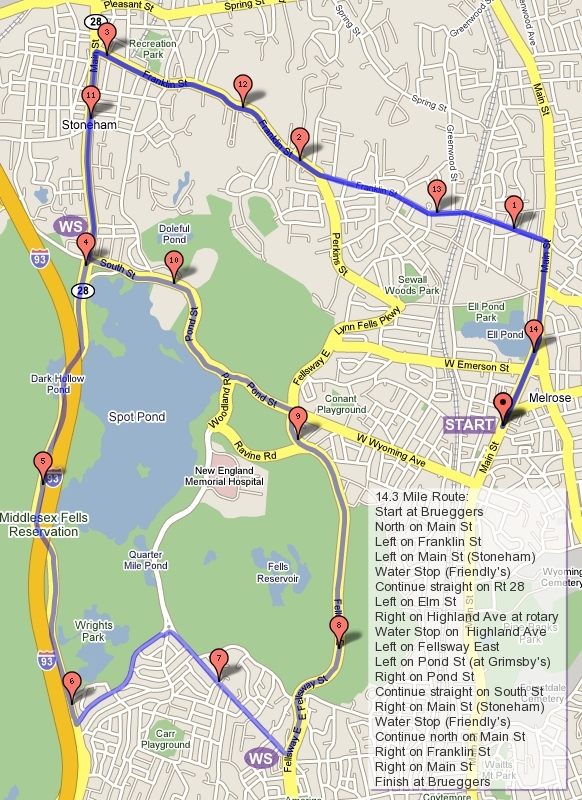 Do I have a volunteer for water stop 2 at Horn Pond? Carol volunteered to pick up Rachelle, then couldn’t, then neverminded her couldn’t I think… I’m assuming Carol will be picking up supplies at my house in the morning? Do I have a volunteer to pick up whoever volunteers to leave their car at Horn Pond? That person would also need to pick up water stop supplies from my house? In the meantime, Cossettes and Gaudet, I’ll be by tonight at some point to pick up the water stop supplies from last week. Around 7:00 ok? So who’s in for the Hurricane Bill humidity-palooza run?ROLL CALL! Relief from the humidity. The last two weeks we’ve struggled through some oppressive humidity, going through water and Gatorade at a record setting pace. This week we awoke to temperatures in the 60s and crisp dry air. With Rick agreeing to handle the major water stop of the day and Walt planting his car for an extra stop for late in the run, I got to be lazy this Sunday and headed straight to Brueggers minutes before 8AM. Having not rushed around coordinating in the early hours I walked into Brueggers a little less frantic than usual which was interpretted by most as very sleepy. In a few dazed moments I had welcomed all, taken their dollars, counted their 21 heads and started them along Main St.
Mary and I escorted the crowd down to Ell Pond, continuously checking over our shoulders to make sure they were really following. Turning on the LynnFells Parkway they still lingered behind, and I started to wonder… am I running way to fast or is everyone taking it easy?No worries, I hadn’t gotten faster, Mary explained that an 8 hour car ride from central PA got her in at 2AM the night before and was in more of a daze than I was. Wayne and BrianG pulled up and from their ability to easily chit chat proved they weren’t going full speed yet, saving some for Breakheart. Behind us was Judi, recovering from her 17 mile run the day before. On our way through the hills that lead us to Wakefield High School and water stop 1 we crossed paths with an acquaintance of BrianG, a local 72 year old runner which is impressive enough but to watch the two of them pull away from Wayne, Mary and I made it all that much more impressive. While the idea of keeping up with them faded the idea of breaking the traffic radar sign record crept in. I quickly explained to Mary and Wayne how we needed to cross the street, get in a close triangle formation in the breakdown lane and pick up the pace as we passed the second to last mailbox before the Wakefield HS school zone radar sign… and hope a car doesn’t come in behind us. Wayne checked over his shoulder, no cars coming, he pulled into the lead of the triangle, Mary and I flanking him, speed increasing as we reached the mailbox and then the sprint ensued. 9MPH… 13MPH, 12MPH! The previous record of 11MPH set by BrianG and I had been broken! The official new record is 13MPH, the 12 probably registering my lagging speed as Wayne and Mary moved out of the picture. We celebrated the record sprint with Gatorade and Cliff Bloks, which Wayne’s heritage inspired him to interprete as blokes instead of block. Rick put the plastic cup clothesline into practice and without much delay we were off into Breakheart. Brian, Wayne, Mary and I were joined by Judi as we headed up towards Breakheart Reservation. Brian’s 72 year old super athlete friend circled around to get him again and with a sigh Brian continued on ahead of us with him. Heading into the parking lot a car passed us and started entering the divided entrance on the left side… until he noticed an exiting pickup truck soming towards him. Brakes squeeling followed by accelerating wheels spinning on the sand on the road as the car quickly darted back to the correct side of the street. Wayne noted the driver may be from the UK… perhaps some crazy bloke that forgot what continent he was on. Breakheart’s hills were greated pleasantly with an accented comment by Wayne expressing fake enthusiasm for the task in front of us. The chit chat of the group pulled us up and down the roller coaster hills, at one point in fact Judi and I were running with hands in the air down a steep decline. At the half way point Brian had stopped with his old buddy and waited to hook back on with us. Passing a water fountain I considered taking an unneeded water break to see if the speedsters would move ahead without me, allowing me to settle back in to my own slower pace. Before I could decide we were past and headed back the flatter side of Breakheart. I kept up with them until the beach, where thoughts of Mary’s suggestion of ending out run there and going for a swim distracted me causing me to slow… or maybe it was just that I’m not as fast as them. Keeping them in sight we made our way back to Rick and another water break. Before the break was over Walt came flying through for a quick sip. Having left his car at the next stop, he had run back to Brueggers, arriving shortly after we left.Â His plan was to run longer and faster, forcing himself to play catch up for some of the run. 7 miles into the run he was already in the lead. The fast group hit the road before I was ready, so Judi and I waited for some company then headed out. Unfortunately for me we waited for Tall Dave and a minute into this section of the run I foundout Judi and Dave were short-cutting it across Nahant St while the full route was taking the longer route to the other end of Nahant St via Farm St, Water St, and Main St in Wakefield. I hooked on with Peter for a bit, then with Carol, pulling into the Nahant St stop to see a rested and happy Judi and Tall Dave still having a drink at Walt’s car, joined by Brian, Wayne, and Mary. A group pulled in right behind me and in no time we all set out for the last three mile stretch to Brueggers. Back at Brueggers the group reconviened, coffee and bagels trying to bring us back to life. A call from Lois let us know that the SLR group of one up in Maine had stopped for water and would be continuing on to finish up 16 miles, making 22 of for the day. What seemed like hours later we finally got up and headed on home, 1/3 of the way through training.